“If you wear a dress and have an animal sidekick, you’re a princess,” snarks the demigod Maui (Dwayne Johnson) when his new acquaintance Moana (Auli’i Cravalho) protests that she’s actually the daughter of her tribe’s chief, not royalty. He’s got a clearly meta point: Heroines of Disney cartoons like Moana are instantly eligible to be inducted into the marketing network of Disney Princesses (at least if their movies are successful), regardless of their actual in-movie lineage. It’s an early sign that Moana, from veteran Little Mermaid directors John Musker and Ron Clements, is self-conscious of its status as the next big Disney Princess movie. How could it not, with such an amalgamated setup? Moana, whose tribe discourages anyone from leaving its small but lush island, dreams of a bigger, more adventurous life, just like Ariel, Belle, and Mulan before her. She also butts heads with her father (Temuera Morrison) and sings a yearning song about her desires before embarking on an adventure—in this case, a mission to find Maui, the disgraced demigod whose theft of a mystical stone has put Moana’s island (and the rest of the ocean) in peril. And like Disney’s version of Pocahontas, she has not one but two animal sidekicks. But when it comes time for Moana to sail off on her own, the animal who tags along is not the faithful, adorable pet pig who capers through early scenes. Instead, she’s accompanied by her secondary sidekick: a glassy-eyed chicken who would be too stupid to live if he wasn’t also apparently too stupid to properly die. Rather than providing crucial help to the heroine, he nearly drowns and/or chokes to death with alarming regularity. It’s a small touch, but the stupid chicken, beyond being a very funny and colorful bit of animation as he pecks vainly at rocks in search of sustenance, tweaks a familiar element of the Disney formula. The animation does some tweaking of its own, in ways big and small. 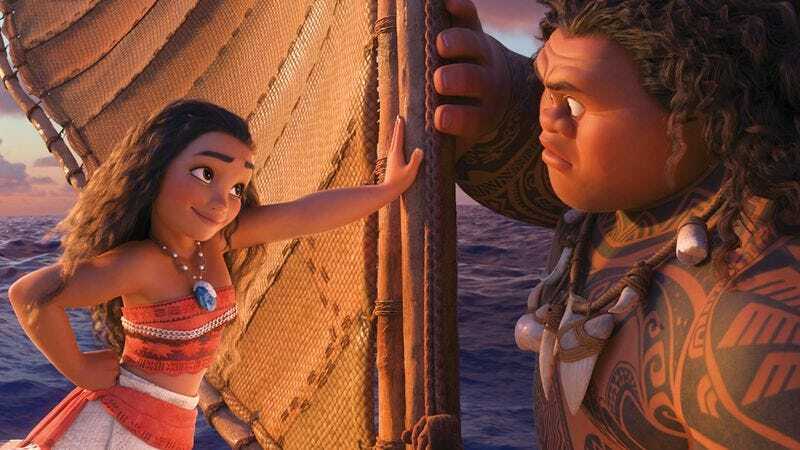 Moana and her eventual traveling companion, Maui, are on a relatively standard-issue hero’s journey, with periods of reflection and character-building alternating with exciting obstacles, but the familiarity is diminished by the artistry of those obstacles. From a gang of diminutive pirates who look like Mad Max villains in miniature to the gigantic creatures Moana and Maui encounter in a realm of monsters to the shimmering sea itself (which has a mystical bond with Moana), the movie presents eyeful after eyeful in gloriously popping colors. It also dabbles in some more 2-D-looking animation, which for one running gag, involves the rarely used tattoo reaction shot. That’s not to say Moana lacks in substance. The filmmakers address some frequent complaints about the Disney Princess Industrial Complex upfront—namely that, despite some diverse cartoon faces over the past two decades, the default design tends to be skinny and white. Pacific Islander Moana is less spindly than the alabaster-skinned Frozen ladies, and as voiced by newcomer Cravalho, she’s an immediately likable figure of headstrong, occasionally bumbling determination. The movie takes care to show her charged with actual administrative responsibilities on the island beyond behaving herself and respecting her elders, and it’s touching to see her wrestle with the fact that she’s good at being an island princess; she just wants to go further. The story doesn’t crowd her with a big ensemble; much of the movie, especially in the second half, consists of interplay between Moana and Maui (plus the chicken). Rather than a love interest, Maui (who wants desperately to reclaim his past as a master shapeshifter) functions as half untrustworthy sidekick, half mentor. Johnson, whose expressive eyebrows have been animated onto Maui’s broader face, does justice to both sides of the character. The superstar and the relative novice pair nicely together. Maui brings a jolt of energy when he enters the movie, which takes a little while to get going, twice. First, it spends a lot of time on Moana’s island before her journey begins, complete with the now-obligatory opening scene showing the movie’s main character as a wee babe, a go-to cuteness move Disney has now indulged in in three or four of its recent hits. 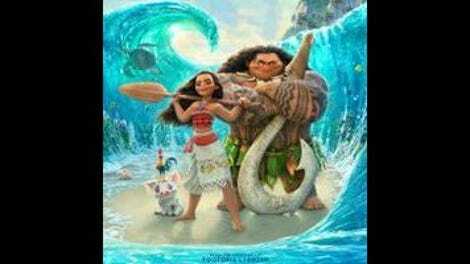 Then, once Moana locates Maui and tries to force him to come right the wrong he committed, the movie takes perhaps too long to get them moving along. Then again, when time is killed by Maui (which is to say Johnson, which is to say The Rock) performing “You’re Welcome,” a fast-paced tribute to himself with lyrics by Hamilton’s Lin-Manuel Miranda, a little padding on the running time can be excused. The song score as a whole, by Miranda, Mark Mancina, and Opetaia Foa’i, is wonderfully eclectic. “How Far I’ll Go” and “You’re Welcome” riff on the styles of past Menken-Ashman classics like “Part Of Your World” and “Friend Like Me,” respectively, while the musical still finds room for a rap bridge and a giant crab unexpectedly bursting into a glam-rock chorus. Occasionally, the movie’s combination of formula and tweaks makes it play like a one-blockbuster-fits-all reconciliation of a standard Disney checklist with a second list of corrective measures. For the most part, though, the movie feels more heartfelt than calculated, no small feat after decades of princesses, journeys, and “I want” songs. Compared to other animation studios, Disney attracts an unusual amount of attention for its representation, optics, subtext, and so on. It makes sense; relatively few films are assured of multi-generation circulation the way a hit Disney movie is. In the end, Moana deserves its pre-built legacy of royalty.